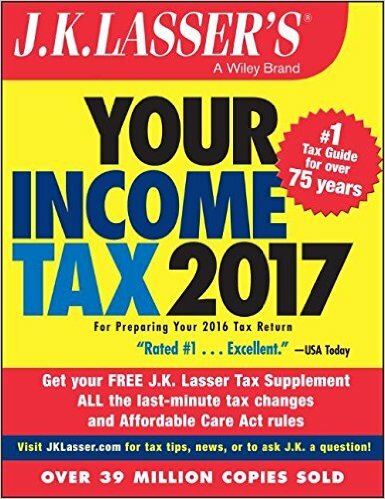 J.K. Lasser's Your Income Tax 2017 puts America's most trusted tax advice to work to help you with your 2016 tax return. Reader-friendly and easy to use, this book answers your most pressing questions to help you maximize your tax savings. You'll learn how the latest tax law and IRS changes apply to your specific situation, and you'll find expert advice on sheltering income, planning, claiming deductions, and more. New tax laws, IRS rulings, court decisions, filing pointers, and planning strategies are highlighted throughout for quick reference, and the companion website at jklasser.com has an e-Supplement that updates the text with the latest tax developments from the IRS and Congress. Using a CPA or tax software to file? This guide shows you what you can do to leverage the utmost money-saving capabilities these services have to offer. Filing yourself? This book gives you guidance and expertise from America's most trusted tax resource for over 75 years. Tax laws are continually evolving, and even if your family situation and finances haven't changed in the last year, your tax-saving opportunities or liabilities may have changed because of new rules. Do you routinely stay up to date on IRS rulings and new tax legislation? J.K. Lasser does, and this book tells you everything you need to know to file your 2016 return. Taxes are complex, confusing, and always changing, and it's tempting to just settle for what you're given—but why leave money on the table? You've worked hard for it, and you're entitled to it. Cut through the complexity and file correctly, on time, for a maximized return with the trusted authoritative help of J.K. Lasser's Your Income Tax 2017. Ask J.K. Lasser! Get YOUR tax question answered!